Domestic work is a valuable, but often unrecognized contribution to the well-being of families and to the functioning of economy and society. Often performed by family members, particularly women, it is neither recognized as a formal component of the economy nor properly compensated. When done by hired labour, it is often not included in the labour laws of the country. Therefore, domestic workers do not enjoy the full protection of labour laws and they are often underpaid and asked to work extra time. 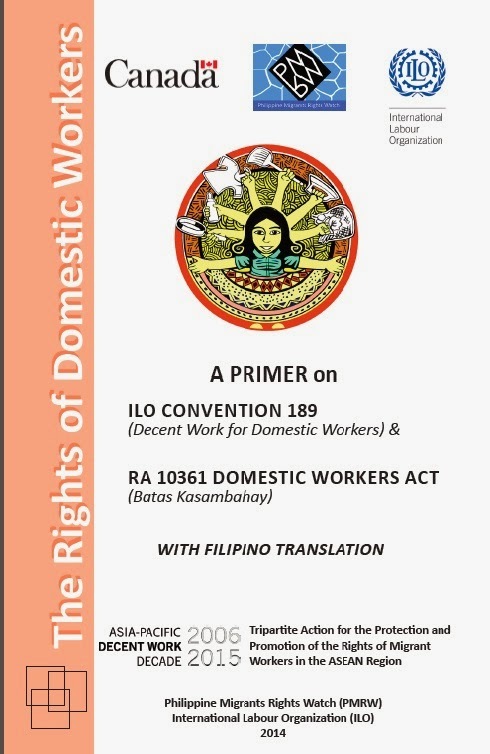 In order to better inform domestic workers of their rights, the Philippine Migrants Rights Watch (PMRW), with the support of the International Labour Organization’s ASEAN TRIANGLE project, has developed this educational booklet on Convention 189 on Decent Work for Domestic Workers and RA 10361 otherwise known as Batas Kasambahay or Domestic Workers Law.